A sad but true fact is that last year there were 100 babies in our country living in a prison. Yes, actually inside the prison. In the prison’s mother and baby unit, to be precise. Prison staff do their best to make these environments pleasant. Some units even have special sensory rooms, so that babies can see colours, sights and sound – even nature – that they wouldn’t otherwise see inside the grey walls of a jail. I understand why this happens. But we should ask ourselves: is it right? When we know the importance of the early years for child development, how can we possibly justify having babies behind bars? Babies and toddlers differentiated the female prison from the nineteenth-century male equivalents. While mothers could be imprisoned alongside their offspring, even up to the age of five or six in some cases in the mid-nineteenth century, fathers were not permitted to take their children into convict prisons. Assumptions about parental roles and gendered expectations and behaviours during this period dictated this practice. The ‘+ female child’ and ‘+ male child’ annotations in nineteenth-century prison admission registers have fascinated me for years. They identify the children who had no other suitable place to go and who thus entered prison with their mothers. These are relatively regular additions to registers relating to Irish female criminals, although of course fewer children entered prisons than remained outside. Accompanying children have also featured in the Toronto and Boston prison registers that I have examined thus far for my AHRC-funded ‘Bad Bridget’ research project. The annotations are tantalising and frustrating. While the carefully-laid out Irish prison registers generally provide information on the mother’s age, religion, place of birth and occupation, little, if any, further information is provided about her offspring. Occasionally even gender is omitted. I am thus left with a litany of questions. Why was this child taken into a prison and in what ways were their experiences within better or worse than what they might have experienced outside? Were they old enough to remember their time in the institution and did they discuss their prison lives in later years? And where, and indeed sometimes who, was their father? The imprisonment of mothers with their offspring limited contact with putative fathers. For some children, being separated from their fathers was not a new experience. The children in prison are, of course, those whose fathers were unwilling or unable to care for them, or even unaware of their existence. The annual reports for the Irish female convict prison for the years 1860 to 1884 specifically notes only one child as having been taken from prison by her or his father. The inspiring Laura Bates noted in a recent article that only 9% of the 17,240 children whose mothers are incarcerated in the UK at present are in their fathers’ care. It is likely that some fathers played a minimal role in children’s lives outside the prison. However, it is also important to acknowledge that other fathers may have been unable to assume full responsibility for their children due to their living or working situations and the lack of practical support for nineteenth-century single parents who needed to work. For permission to reproduce this image the author is grateful to the Director and the Head of Reader Services of the National Archives of Ireland. In 1893, Mary Sheahan, the mother of six children, was arrested in Galway on suspicion of having stolen a purse containing £70 from a neighbour, Mrs Kelly, married to a victualler. Sheahan was described as the ‘wife of a very poor labouring man … [who] earned her livelihood by hawking fruit and vegetables’ and was ‘of a quarrelsome disposition and intemperate habits’. She was accompanied to the local prison in Galway by her infant, whom she was breastfeeding at the time. Sheahan was convicted and sentenced to penal servitude for five years in the Irish female convict prison at Mountoy. Despite having taken her infant to the Galway prison, she opted to leave the child with her mother on her removal to Dublin. Sheahan’s husband was evidently not in a position to take care of all of the children during her absence. The regularity with which women left their children with their mothers or sisters or other female relatives or friends indicates the persistence of traditional gender roles. In this case, however, the father likely had easy access to his infant given that he lived on the same street as his mother-in-law. He therefore was in a better position than other fathers to maintain the parental bond and involve himself in the day-to-day life of his offspring. Mary Sheahan wrote to her husband as regularly as the prison rules allowed and received written replies from Galway. Although the letters have not survived, they likely included references to the children. 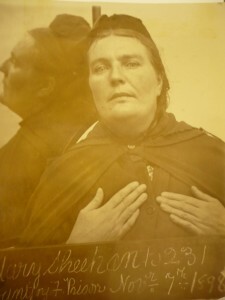 Sheahan was released from prison on 11 February 1897 and returned home to her husband and children. She was rearrested that summer for being drunk and disorderly and it was noted on her return to the Dublin convict prison on 29 September 1897 that she was now pregnant. Children born to incarcerated women, like those who accompanied their mothers to prison, were separated from their fathers for the first few months, or indeed years, of their lives. Annual reports for the years 1854 to 1882 that document the number of births within prisons indicate that at least ninety-eight infants were born to Ireland’s female convicts. Sheahan gave birth to a daughter on 31 January 1898 and remained in the prison with her infant until her release in November of that year. She did not receive any visitors during her incarceration, indicating that her husband did not meet his new daughter until she was almost ten months old. It was not particularly unusual for inmates from outside Dublin not to receive visitors given the time and financial implications. If the 1911 census is accurate, the couple did not have any additional children and by that stage only three of their seven children were still living. The children who resided in the Irish female convict prison with their mothers were removed from the home and people whom they knew on the outside. As my recent article in Social History highlights, children in prison, like those in other institutions, could suffer illness and abuse, but were guaranteed meals and had greater access to medical care than they may have had outside the prison walls. Prison life may thus have been more stable for some children but it also removed them from their fathers, siblings, extended family members and family friends. Today many prisons around the world have developed parenting programmes. Although babies in the UK and Ireland continue to reside in prisons with their mothers rather than their fathers, there is a growing awareness of the need to facilitate communication and visits between male as well as female prisoners and their children and the benefits that this can bring to both parent and child. Elaine Farrell is Lecturer in Irish Economic and Social History at Queen’s University Belfast. Her research focuses on women in the nineteenth-century Irish female convict prison. She is also CI on the AHRC-funded project ‘Bad Bridget: Criminal and deviant Irish women in North America, 1838-1918’. Her article ‘‘Poor prison flowers’: convict mothers and their children in Ireland, 1853–1900’ can be found in Social History 41, 2 (2016), 171-191. E. Farrell, ‘“Poor prison flowers”: convict mothers and their children in Ireland, 1853–1900’, Social History, 41: 2 (2016), 171-191. F. Taylor, Irish Homes and Irish Hearts (Boston, 1867), 55-57. Farrell, ‘Poor prison flowers’, 182. Case file of Mary Sheahan, National Archives of Ireland, General Prisons Board, Pen/1898/118. Farrell, ‘Poor prison flowers’, 172-3. This entry was posted in Uncategorised on 3rd May 2016 by Grainne Goodwin.